Following the heartbreak of Jeremy, Duke of Bainbridge, as seen in The Adventuress, Lady Emily decides a change of scenery would be best for her friend. In an attempt to lift his spirits, Lady Emily and husband Colin Hargreaves, whisk Jeremy off to a holiday in Greece. They are joined by Emily’s good friend Margaret. A lover of all things Latin, Margaret and Emily plan lively debates and entertaining excursions. The friends will stay on the island of Santorini at Emily’s villa, left to her by her deceased first husband, Lord Philip Ashton. Philip left for a hunting trip to Africa right after the couple was married and died abroad, victim of poisoning. Perhaps it is the impending trip to the island that Philip was so fond of, Emily is haunted by thoughts of her first husband exacerbated by strange occurrences that plague her mind. First, an unsigned postcard arrives addressed to The Viscountess Ashton, a name she has not used in over five years since her marriage to Colin. Then, Philip’s journal entry of the night of their engagement is pulled out of its hiding place and put in plain sight. Finally, Emily is sure that she has seen the ghost of her dead husband both on the boat to Greece and hiding behind a column in the ruins. When the friends arrive in Santorini, the housekeeper shocks them with the news that the Viscount Ashton is there. Although his face had aged by time and the sun, Philip is who Emily remembers. He recounts a fantastic tale of an escape from near death by poison, of wandering through the plains of Africa, a rescue by a kind-hearted traveler, and a renewed passion for archaeology. As overwhelmed by confusion as Emily is, her husband, once Philip’s best friend, is beset with grief and guilt at the possibility that he had left his friend for dead. The couple is also unsure how his arrival will affect the status of their marriage and more importantly the legitimacy of their children. The conflict mounts as they discover that Philip has been pursued by an illegal antique artifacts dealer who is convinced that he is in possession of a piece of Achilles’ helmet. An expert and scholar on Achilles, Phillip is convinced of the authenticity of the artifact that he discovered but distraught at how it was stolen from him moments after its unearthing. The tension rises as dead bodies, mysterious conversations, and haunting clues follow as Emily and Colin must work together to prevent more loss and to salvage their marriage. Oh, how I loved this book!!! I have been reading Tasha Alexander’s Lady Emily series for years but I think this one might be my favorite. She hearkens back to the adventure and uncertainty of Colin and Emily’s first escapes together; there is a sense of a simpler time as they struggle to grasp hold of what they know and hold most dear. At times the reader isn’t sure if he can trust Emily’s perceptions as she is often clouded by pain, guilt, and fear. I really enjoyed the development of Colin’s character; he always seems to be so in charge and in control. In this novel, we see a break in the calm, cool exterior. His obvious love for Emily and his genuine compassion for his friend present conflicting emotions and he at times seems a bit lost. I think this adds a great deal of humanity to his character; the dimension of his raw emotions and his true sense of integrity and honesty create a disjointedness and vulnerability that makes the reader enjoy him even more. Philip’s character is the most fascinating in the story. We are reminded how time distorts memories and we can’t always trust what Colin remembers about his friend. Emily interaction with Philip prior to his departure to Africa consisted only of their courting and very brief marriage; she knows him only through the journals that he left behind. Philip too has created idolized memories of Emily and their relationship. Throughout the novel, I felt a sense of heartbreak for these characters and the conflicting emotions that they must be facing. At the same time, the tension of the stolen artifacts and the ensuing violence build to a very climatic ending. 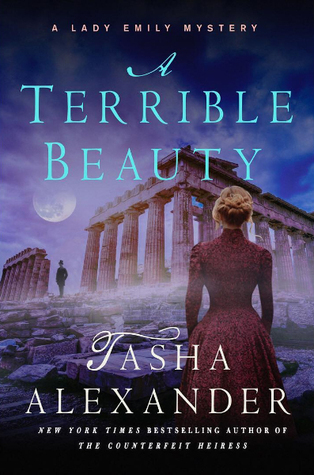 I know that I have mentioned this before, but Tasha Alexander’s biography indicates that she was an English major “in order to have a legitimate excuse for spending all her time reading.” You have to respect an author who loves reading as much as she does! This story further capitalized on Emily’s (and the author’s) love of Greece. The descriptions of the sites visited and the historical details provide a feel of a travelogue, meshed with an exciting story. Read the series in order. You will do a disservice to yourself if you miss any of the previous adventures.